Roasting meat over a fire requires careful turning. 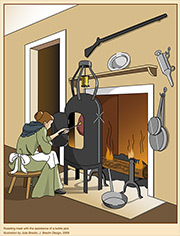 From the 1400s to the 1700s in aristocratic kitchens, servants or animals performed this tedious task. Dogs or geese ran inside a caged wheel or on a treadmill to turn a spit. Young male servants were often called "Jack," and the word became a name for an assistive device. 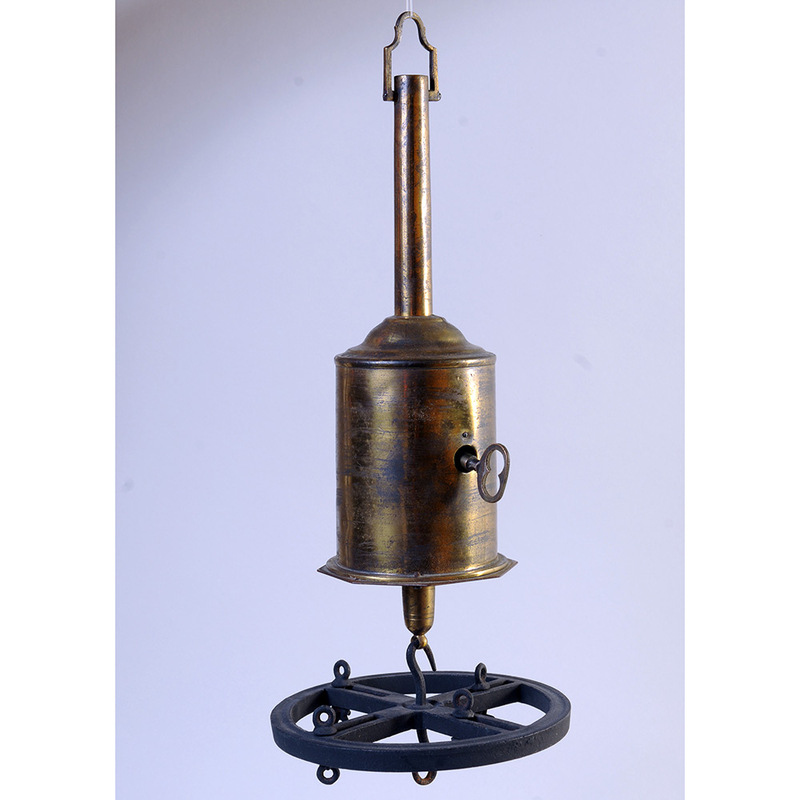 By the 1600s, blacksmiths and clockmakers had invented spit-turning mechanisms that employed gears and pulleys. 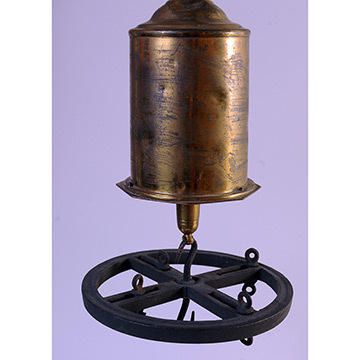 In 19th-century Britain, a compact cylindrical "bottle jack" such as this one was popular in smaller homes. The brass cylinder houses a spring-driven mechanism wound with a key. Meat roasted vertically, as the bottle jack turned and then reversed it. 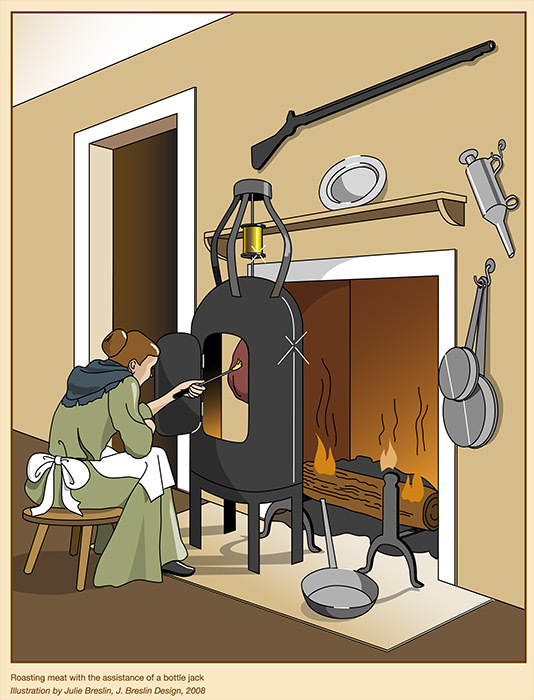 Fat could be hung form the four small hooks on the cast iron wheel to baste the meat automatically. 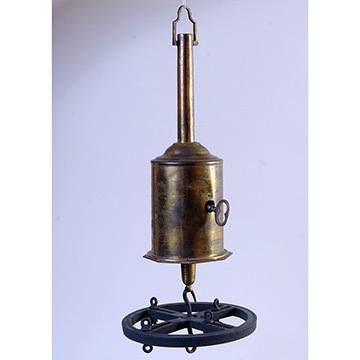 A bird or a joint suspended from the bottle jack hung inside a half-round metal reflector oven that stood before the hearth fire. The reflector ensured more even cooking and held a pan to collect the drippings. Through a door in the front, the cook attended to the meat, which diners would enjoy " done to a turn."